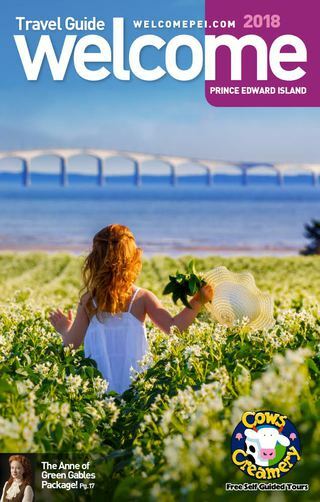 One of the most breathtaking constructions of the modern era, linking Prince Edward Island across the treacherous waters of the Northumberland Strait to the mainland, is the Confederation Bridge. Since 1997, the bridge has been the longest over ice covered waters in the world! With a span of 12.9-kilometres, the bridge was constructed using extremely durable high-grade concrete and reinforcing steel. It tested the skill and ingenuity of engineers. This revolutionary landmark challenged Islanders’ sense of themselves, their past and their future. Many called it the “Fixed Link” during construction. It was given a life expectancy of over 100 years, and was the final nail in the coffin for the New Brunswick ferry. We decided to put on our walking boots and search for the five best places to view the Confederation Bridge. Here is what we discovered. Imagine walking through a field full of spruce and pine trees onto a fiery-red beach. The tide is rippling out, causing islands of sand to emerge from shallow water. In the distance, the Confederation Bridge stretches across the Northumberland Strait. This spur of land is Chelton Beach Provincial Park. Located just off Route 10, near the rustic old village of Bedeque, Chelton Beach has a cottage country charm. Even in the peak summer season it is perfect, with supervision, a children’s play area, showers, flush toilets and a canteen, and the best part is it never gets overcrowded. My favourite time to visit this beach is during the fall. The summer heat and swarms of mosquitoes are gone. The air feels crisp and cool. And other than a few sea creatures washed up from the ocean, you will usually have the beach all to yourself. 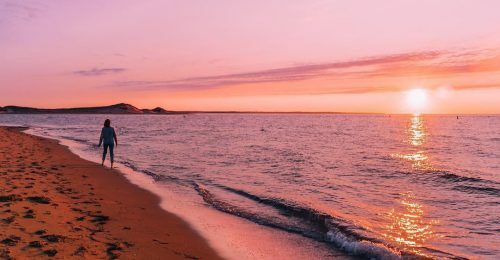 This beach is also recognised for its soul-stirring sunsets. 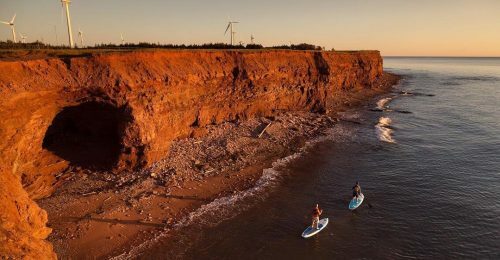 The rays glitter across the ocean, and highlight the most recognisable landmark on the Island, the Confederation Bridge, and then reflect off the rich red sand. 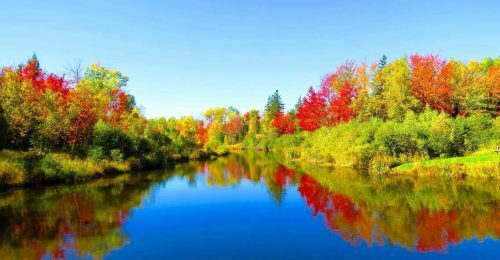 If you are here in the fall, you will see a patchwork of fiery reds, golden yellows, and flaming orange hues this time of year when driving to Cape Traverse, a community in Prince County. We ventured out this way to walk our dogs. Here a feeling of timelessness surrounds you. The gentle rhythm of the waves makes life slow down. Cape Traverse was not always this peaceful though. During the 19th and 20th centuries, the community was an essential link, transporting both mail and passengers to the mainland with its iceboat service through the Abegweit Passage. The crossing was hard and dangerous because of the freezing slushes and tidal currents. Now, the Confederation Bridge, a modern engineering feat, crosses this portion of the strait, and an original iceboat rests in an outdoor interpretive display off of Route 10 in Cape Traverse. On the south-central coast of the Island is the community of Fernwood. The highlight of Fernwood – literally – is Sea Cow Head Lighthouse. The octagonal lighthouse was built during the summer of 1864, making it one of the oldest landmarks on the Island. 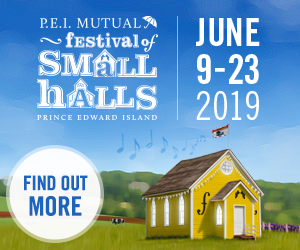 It appeared in the opening scene of Sullivan Productions Anne of Green Gables and in many episodes of the Road to Avonlea series because of the beautiful scenery. 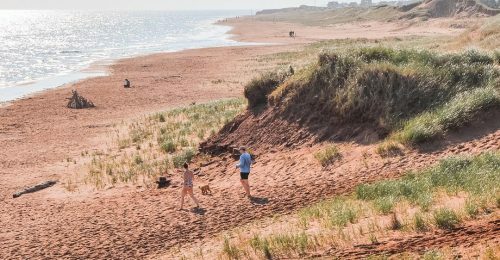 The lighthouse overlooks red cliffs lined with spruces and the relentless swells of the Northumberland Strait that paw away at the beach, continuously redrawing the contours of this coast. My husband and I sit at the edge of an eroded cliff and scan the ocean for passing pilot whales or any signs of seals and walruses (formerly abundant in the water here and the reason behind the lighthouse name). We can’t see any sea life, but what we do capture is the span of the iconic bridge going all the way to New Brunswick. Borden-Carleton is a scenic small town, with a Marine Rail Historical Park, at the foot of the Confederation Bridge. The park features a lighthouse, observation deck, train, and memorial. Currently the park is undergoing renovation, but the view is unparalleled. We noticed that the tide was out and decided to take full advantage by climbing down the bank of grass, and over the boulders of rock, in order to touch one of the enormous cement pilings that are a part of the bridge foundation. Standing underneath the bridge, we felt miniscule in comparison. The vehicles crawling along looked like toys! It really gave us a different perspective, and made us wonder what challenges the engineers must have faced. Throw caution to the wind and take a short road trip across the Confederation Bridge. It’s a great opportunity to relive old glories and create new memories. It took us 12 minutes to cross, which is a lot faster than taking a ferry. It was worth the $45 toll just for the experience, and it’s nice to know the money is used to maintain the structure. There are two great vantage points from the New Brunswick side. At the foot of the bridge, in Bayfield, we walked down a boardwalk near the ocean, through coastal forests and marshes. The land around the boardwalk is undeveloped, undisturbed and idyllic. The path eventually connects to a nature centre. Cape Jourimain Nature Centre is much more than just a gift shop and restaurant. You can broaden your knowledge by learning about the construction of the “Fixed Link” from NB to the Island in an environmentally-friendly building. I discovered that the bridge was built from both ends towards the middle, with a gentle curve to reinforce its strength. The bridge took four years to build at a total cost of $1 billion dollars. It has changed Island life forever. Desiree Anstey is a writer and blogger. Born in South Africa, she lived there with her family until she was six years old. The family then moved to the United Kingdom, where Desiree graduated with an MA in Journalism from Lincoln University. She currently resides in Prince Edward Island with her husband and two dogs. Together they enjoy exploring the Island and discovering all its hidden gems.